Made from red grapes with a process normally used for white, rosé wine ranges from dry to fruity and full-bodied. 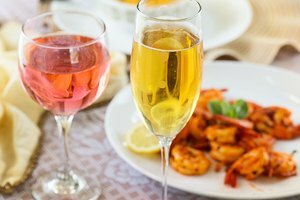 Perfectly serving a glass of rosé means serving it at the right temperature, using the right glass, and if your guests are feeling hungry, finding the right food pairing. Like white wine, rosé wines benefit from a cooler serving temperature. Chill your rosé to about 50 degrees before serving. The simplest way to do this is to keep the bottle in the refrigerator for a few hours. As a rule, drier rosé wines do better at low temperatures, while sweeter wines taste better at the higher end of the scale, up to 55 degrees. Increased temperature brings out the aroma of the wine. After opening the bottle, you can leave it out and let it warm slightly; this will bring out more of the wine's flavors. This method creates a wine that changes subtly in character as your meal goes on. The shape of a wine glass channels aromas and flavors, accentuating the characteristics of the wine. The correct glass to use for rosé wine depends on whether the wine you're serving is dry or sweet. Fruitier, sweeter wines benefit from a glass with a flared opening, which concentrates the wine on the part of the tongue most sensitive to sweetness. By contrast, a glass with a more tapered bowl suits drier wines. If in doubt, use the same glass for rosé as for white wine -- the two styles are very similar. 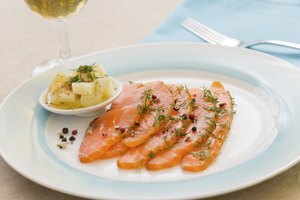 Rosé is a very versatile wine in terms of food pairings. 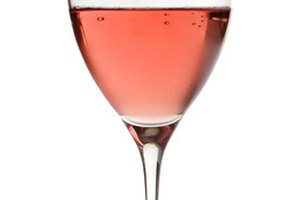 Dry rosé complements strongly flavored dishes, particularly those with herb flavors or lots of garlic, although light-bodied dry wine may not stand up to very strong flavors. Try it with olives, grilled vegetables or tomatoes. Dry or medium-dry, this is an excellent barbecue wine. Even the driest of these wines have some hints of fruit, so pair with foods that also have some fruit, such as salads or prosciutto with melon. Sweeter rosé is also an excellent barbecue wine and pairs well with spicy food.